Dakota Star Pillow Case Set of 2 by VHC Brands - P.C. Fallon Co. The Dakota Star Pillow Case Set of 2 includes 2 pillowcases, each measuring 21" x 30". 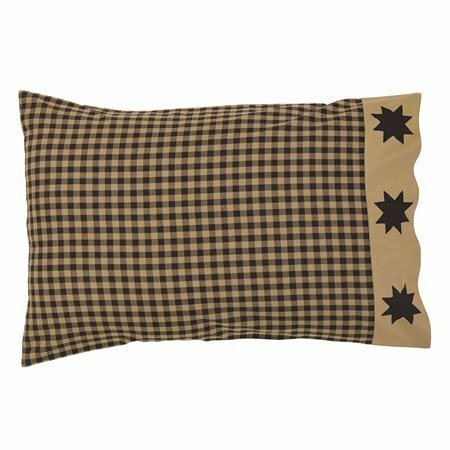 The pillowcase is made of black and khaki checks and is accented at the opening by a khaki band featuring three appliqued stars. 100% cotton. Sold as a set of 2 pieces. This item is imported. Please note, colors may appear differently in different resolutions and on different computers. From The Ashton & Willow Line made by VHC Brands. Manufacturer's UPC code is 840528108426.